TAKA Turmeric is run by mother and daughter team Karen and Talia. The company specialises in creating delicious turmeric products. Talia says, ‘growing up on a sustainable nature reserve in Cape Town, herbs and spices were an essential part of life. Tumeric was always a favourite of my mother’s, who learned about the positive benefits of this vibrant yellow spice when studying Ayurveda. She used it for everything, from herbal infusions to grazed knees and so the whole family (even our dog), grew to love it. As a mother and health practitioner, Karen kept her family healthy with natural remedies and firmly believes that “food can be your medicine” as Hippocrates instructed nearly 2,500 years ago. A qualified nurse and massage therapist specializing in pain relief, Karen discovered that turmeric, known for its anti-inflammatory and pain relieving qualities, especially beneficial and started giving it to her clients, family, friends and pets to consume on a regular basis. While the results were astounding, most people didn’t like the taste of turmeric on its own. This led to the quest to find the perfect recipe. Karen and her daughter, Talia, joined forces in January 2015 to form TAKA Turmeric with the mission of creating delicious medicinal teas and drinks that people would enjoy and crave daily. Combining science and culinary magic, Karen and Talia have managed to make TAKA Turmeric beverages delicious as well as healthy. They believe in taking the herb as close to its natural form as possible. Instead of taking turmeric as a pharmaceutical extract of curcumin or plain – as a powder, you can now include it into your daily diet as a delicious tea, latte, hot chocolate or in your smoothie. 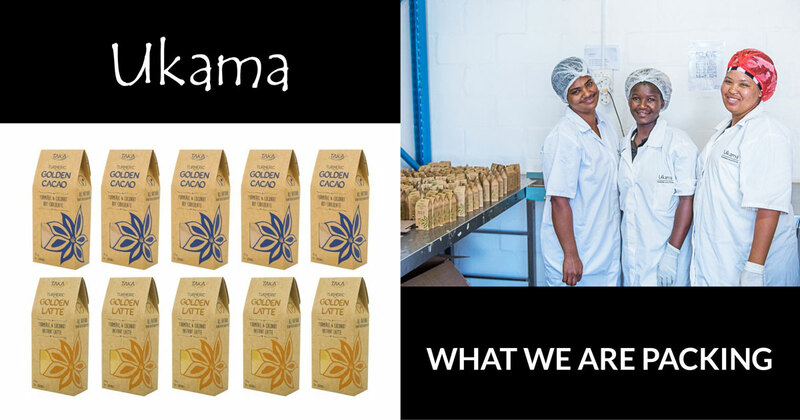 The Ukama packing team for TAKA is headed up by Bronwyn, who started her own micro- enterprise in 2014 and employs 2 staff members. She and her team pack all of Taka’s products with love and care. This entry was posted in packing solutions. Bookmark the permalink.